2015 brought us a little more inventory, a few more home sales and slightly increased home values. Most towns saw modest appreciation except for Harding where the average home price dropped a whopping 21%. This lends credibility to the idea that people now prefer to live in walk able communities with easy access to schools, transportation, shopping, dining, and services. Few in our area seem to value land and solitude over convenience like they did years ago. When you're driving the kids to and from events, a few extra miles adds up to hours in the car. 2016 will be more of the same. Modest gains in number of homes sold and prices. Inventory will climb a bit more. 2016 Mid-Year Review. So far, 2016 has seen a small climb in average price and a drop in inventory. A smaller inventory makes a somewhat crowded market that can often lead to multiple offer situations! With less competition in the market, right now is a good time to sell in most towns! If you would like to know what that means for your particular property, contact me today for a free consultation, Trish Giassa at 201-960-2090. There’s a chill in the air today making it clear that Summer and Indian Summer are over and Winter is on its way. As a skier, I am eagerly awaiting a few days on the slopes, still, I will miss the flip flops and summer dresses. At work, we’re caught in a bit of a forced slowdown. Although there remain many motivated buyers, the homes are simply not there. Inventory levels are lower than ever, while the number of sales continue to increase. As you might expect, if you believe the law of supply and demand (and I do), then home prices will continue to rebound. Many sellers are waiting until Spring. Hmmm … how good an idea is that? How does your town stack up with inventory and prices? Why sell to a builder? I’m sure you've noticed … older, smaller homes have been taken down and replaced with new, larger homes. Homebuyers everywhere like the advantages of a new home. Let’s face it, floor plans designed for today’s lifestyle, plenty of room for growing families, etc. No worries. When you sell to a builder, your house is sold. You won’t have costly credits or repairs, you won’t have to worry if the financing comes through. You sign the contract and plan your move. Simple. Easy. Stress-free. We have a Google App – find open houses, any home listed for rent or for sale wherever you are! So, you're driving the kids to school and you spot a new For Sale sign - you can call or text me for the details ... or ... you can use our own Google App to get the inside scoop in seconds! On your SmartPhone download the app from iTunes Store, Google Play or Windows Store (it’s free). Search for Keller Williams Realty. Then enter KW2D9VPWE. Or, it’s easy to scan with this QR code. If you're thinking about buying or selling it is never too early to contact us. We can help you prepare your home to sell or help you understand the home buying process. Call 201-960-2090. We look forward to serving you! I can't believe it's already mid-July and half the year is behind us. Looking forward to the rest of2013, it should be a very good year for real estate, on a local and national level. Multiple offers abound, we continue to experience low inventory levels with active, qualified and ready buyers ready to buy! This real estate market is more active than it has been in over 6 years! And ... about time! Click above to view a short video. As interest rates rise slowly, home price increases should also slow down. We cannot sustain 10-20% price appreciation per year, but exactly how it pans out, we will have to wait to see. 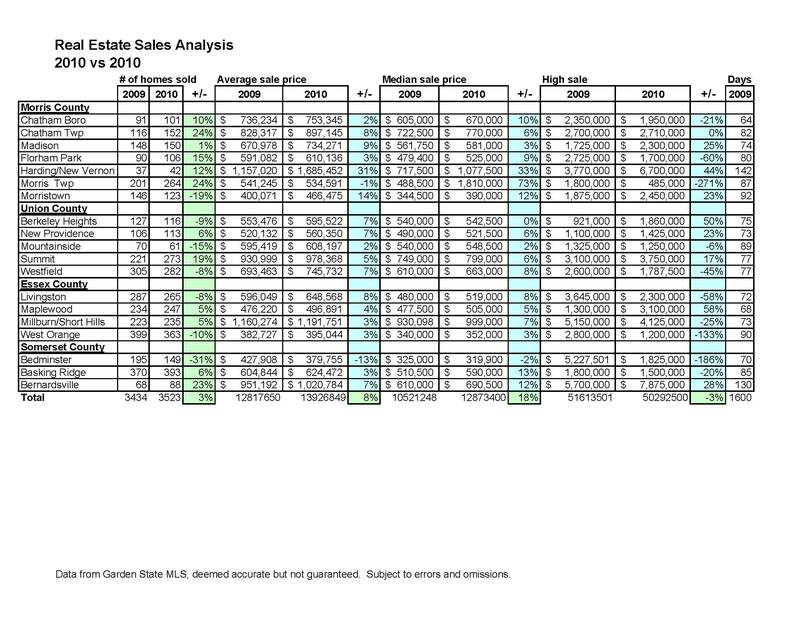 Meanwhile, take a look at the comparison of 2012 sales vs2013 sales (year-to-date) below and contact us for an up-to-date and confidential assessment of your home. Thinking of selling or know of someone who is? Chatham, Madison, Morristown, Morris Twp - up to $580,000 with a nice yard. Fixer upper ok. Or a two family. Builder looking for a few good properties for new homes - Madison, Chatham, Summit, Short Hills, New Providence, Morristown, Berkeley Heights, etc. Would you like to sell for cash and without a home inspection? With this kind of market, representation is key and our team of seasoned professionals will ensure that you will be positioned to sell your home for the very best price by capitalizing on proven marketing techniques and strategies. We invite you to call us for a confidential consultation or second opinion. Still on the fence about buying a home? Summer is a great time to get a better deal! There is no doubt that the bottom of the market was last Fall and early Winter. Hindsight is always 20/20. However, one thing we do know is that real estate is cyclical. The old cycle is over, the new cycle is just beginning. Yes, it can be frustrating with inventory levels so low, but with our team you can count on us to actively prospect to help you find the home of your dreams. We will advocate for you and consult with you to help you attain your goals. Call or email us today 201-960-2090 or email Trish@BestNJhomes.com. It's going to be a good year! We're all a little bit beat up by Sandy, Irene, and the economy and we don't know what's coming but for one thing: it is going to be a good year for real estate! The Market is Already Hot! One of our open houses last weekend had 70 people come through! Yes, you read that right, it's not a typo....70 people! Our phones have been ringing, emails are popping into our inboxes daily from buyers inquiring about buying a home in our area. Home demand is up and...inventory is down. This creates a "sweet spot" for those sellers who are ready to sell now, before everyone else gets on the bandwagon and puts their home on the market. Less inventory means less competition and a better price. If you would like to know what homes in your neighborhood are selling for, click here. Buyers Beware: You have Competition! If you've been sitting on the sidelines waiting for the opportune or "safe: time to buy a house, this is your "sweet spot". And, it seems, many buyers know this. Home prices have stabilized but are still low. The Jeffery Otteau Valuation Group predicts that home prices will rise by 3% this year in NJ. And rates, of course, are still amazingly low! You should expect serious competition for well-priced houses. You will not be the only one making an offer on a nice home. Be prepared to compete to get the best home at a reasonable price while interest rates are still low. BONUS: Call Trish - Our Team will help you win! NJ Monthly recently published its infamous Top High Schools Report amidst glee and concern among our communities where home values are closely tied to the quality of our school systems. That being said, there are over 300 school districts in New Jersey and anywhere in the top 50 is a very good place to be! Congratulations and thank you to all our fine schools, students and parents for making our job of selling homes so much easier! • There’s really only a few indicators we like to be down and an important one is the number of homes available for sale. Take a look at the graph and you can clearly see that inventory is down - in Morristown, Madison, Florham Park, Summit, Harding, Maplewood and more. • Another solid indicator is the # of homes sold – year over year, this is UP! • These two numbers are the key to the supply and demand equation. Let’s watch this trend. Stay tuned. • Sale prices are a bit of a mixed bag. Just under half of our communities show even or increased average sale price. • Some of that is still reflective of the higher price ranges – a few high end sales (or not sold) will easily skew this number. If you want to know what kind of factor that is for your town, contact me anytime for details. • Homes are selling slightly faster. Nothing crazy, just going in the right direction. In case you haven’t noticed, tear downs, new homes have picked up in nearly every town. Buyers love a new house and builders are back in business. How do you know if you’re a candidate for a tear down? Or, if you should sell to an end-user home buyer? I can help you figure that out. With interest rates still so low (jumbos just under or around 4%), solid school systems, bucolic towns and neighborhoods, and, of course, a great commute just about anywhere in the metro area but especially to NYC, we are in one of the most desirable areas in the country. Our home values reflect that. Still think it’s a tough market? Not with the right agent. If you’re a seller, I can help make the process easier, advocate for you and strategize with you to sell your home for the highest market value possible. Contact me for a current valuation of your home and to learn about my proven strategies for staging and selling success. I am here to assist you, your family, friends and colleagues with any real estate matter and homes in Chatham, Madison, Summit, Short Hills and neighboring towns. Take advantage of me and my team’s extensive local knowledge, online marketing expertise, experience and resources. I look forward to hearing from you soon. Thank you for reading and have a great day! Data from Garden State MLS. Deemed accurate but not guaranteed. Subject to errors & omissions. Data from Garden State MLS, deemed accurate but not guaranteed. Subject to errors and omissions. When the hurricane followed our earthquake and then the snowstorm and days of power outages decimated our "Fall real estate market", many of us thought it was all over. Thank goodness, that was not the case! In the last couple of weeks, and yes, in the midst of Thanksgiving and other Holiday preparations, buyers who were not able to brave the elements to look for a home, have been doing so. We are seeing an uptick in higher end homes as well as relocation. And, for those buyers who are ready, there is significantly less inventory, creating a favorable supply/demand situation for local sellers. Are home prices going down or up? It depends. When there are many homes for sale in the same price band, buyers have choices and they will choose the home in the best condition, in the best location, with the best price. When there are fewer homes (such as now, when many sellers typically take their homes off the market or wait till Spring), buyers don't have as many options. Remember that law of supply and demand? When you are ready. You see, at this time of year there are fewer buyers, but they are motivated and ready and willing to buy. Come Spring, there are more buyers but they often include a fair number of tire-kickers. When is the right time for you? That is a good time to sell. As the snow continues to pile up it's amazing how many buyers are stepping up to buy ... normally this is a quiet time of year where buyers and sellers alike snuggle in and wait until Spring to get "moving". Yet, concerns of rising interest rates are contributing to the trend of increasing sales. Another trend: locally our real estate market stabilizing. Inventory is down from previous years and absorption rates of less than 6 months of inventory are a clear indicator that another sellers' market is in front of us. These last few years have been rough and the worst is behind us. Initiatives like combining services to reduce town administrative costs are to be applauded. Our schools continue to attract young families, and our easy commute to NYC continues to attract affluent families to our communities. These are major stabilizing factors for our real estate. Some towns experiencing double digit increases. For example, Chatham Township sales are up 24%, Summit up 19%, Millburn-Short Hills is up 5% (see below for details by town). Most of the increases here can be attributed in part to more higher end homes selling than previously. Madison's average sales price is up 9%, Morristown is up 14%, New Providence a strong 7%, Livingston is up 8%. Number of days on market are down 11% overall. Only a few communites had days on market in triple digits. Chatham Borough homes sell the fastest with 52 average days on market. Not with the right agent. As a buyer, you cannot afford not to take advantage of still-low interest rates and a market that is on it's way back up. As a seller, contact me for a current home valuation and to capitalize on incoming buyers and low inventory. The weather here in Summit NJ, with very few exceptions, has been nothing short of fantastic this Fall. As I write this the sunshine is pouring in the windows, the leaves are gold, red, orange and every shade in between! I love this time of year! The Summit NJ real estate market has similarly been excellent. At a time when the economy is still struggling and many communities are losing homes to foreclosure, we have very little of that. Average sale price to list price went from 96% to 97%. None of these are dramatic changes but the most important one, number of sales, is indicative of more buyers in the market which leads to stability in our real estate market. There are some subtle differences from town to town but overall this is what's going on. If you would like to receive a detailed report for your town, just call or email me. This summary includes homes in Chatham, Madison, Morristown, Millburn-Short Hills, Maplewood, Livingston, Summit, New Providence. Also, if you would like a current assessment of the value of your home, call or email me. It is a free service to you. It's been a wild ride this year ... and we didn't know it before, we surely must know by now that real estate is local, local, local! Fortunately, our locales are healthy and well! The number of sales of homes this year over last increased 73% overall, in some cases doubled. Home prices in Short Hills, Summit, and Chatham NJ increased a bit. Overall, I would say that prices mostly held steady but average prices inched up a bit as the higher-end buyer re-entered the real estate market. Take a look at this graph, breathe a sigh of relief that buyers are coming back in solid numbers to our towns and contact me for help in buying or selling that special home. Real estate analysts agree that real estate values are better than they have been in a long time; affordability indexes are now becoming reasonable for our area. If you are thinking of selling your Summit or Chatham NJ home, this is the time to step up and put your home on the market, while your competition is smaller. We are prepared to help you stage and price your home for maximum results. We have honed our marketing and negotiating skills to help make your home sale a success! Call or email us for more information. If you are a buyer, this is the time to contact us to find out what is for sale in your area and price range. A small rise in interest rates can make a huge difference in the cost of your new home and rates have been inching up. Don't delay and pay more for the same loan! Contact us for a Homebuyer Consultation to discuss your needs and home purchase today. Last year at this time there were 261 listings, now only 246, with the bigger reduction in the Township. More than double the # of closings this year over the same period in 2009. Average days on the market are down from 74 to 66. Average sales price of sold listings for this year to date is $633,750. Is definitely holding its own. There are about the same number of active listings but sales are up. 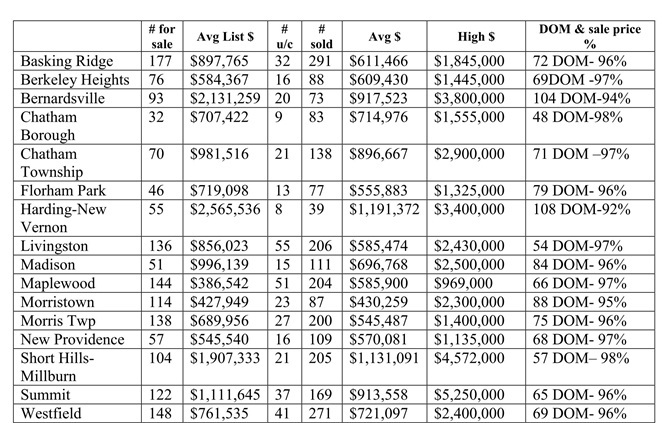 24 properties under contract so far in 2010 with an average price of $799,574. Closings are up also with 87 year to date and an average price of $625,353. Homes and condos are selling at an average of 93% of asking. More closings this year too but average sales price has slid to $697,258. This, I believe, is a temporary phenomenon indicating the lower end of the market has been very active, more so than the higher end. Generally this converts into move up buyers and higher average sales prices in the following months. We'll follow this one and report next month. Also, this year we have double the number of properties under contract, with average prices 8% higher than this time in 2009, at $848,670. We’re seeing several upper tier properties come on the market driving average prices up. For example, in 2009 27 home sunder contract at average price of $1,363,326. This year 26 properties, average price $1,549,804 - 12% higher than last year! Closings to date are also outpacing last years by 45% and the average sales price is $1,213,000. Happy New Year and welcome to a new decade! Good news! Locally our property prices have, for the most part, continued to hold their value. In fact, in many towns inventory is low and sellers who are willing to get ahead of the spring market are finding that they have very little competition. The real estate climate is definitely warming with active, serious buyers in most price ranges. Of course, real estate is all about location and the nuances change from place to place. This month, this is a look at 2009 vs 2008. It’s really a mixed bag, and a good mixed bag overall. Future emails will focus on current activity and trends we see as we work with buyers and sellers on a daily basis. We hope you find this information helpful and informative. Feel welcome to share with neighbors or friends and family. Call or email us with any questions or concerns you may have. We can shed light on your particular location and situation.